Pope Benedict XVI, the former German Cardinal Joseph Ratzinger, has completed his first foreign trip with an open air mass for more than 500,000 young Catholics. At the very end of his journey he also made a frank analysis of the problems his one billion-strong Church is facing. "Freedom is not simply about enjoying life, but rather about living by the measure of truth and goodness," he said. The Pope made no specific reference to sexual morality. There was no finger wagging, yet he gave a clear restatement of Catholic religious principles. In an unusually frank address to Germany's 80 Catholic Bishops delivered shortly before he left Cologne, he admitted that Christianity is on the decline in the country where the Protestant Reformation started. "Many people abandon the Church, or if they remain they accept only a part of Catholic teaching," he said. 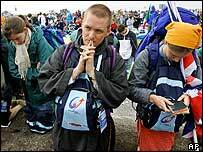 The Pope had previously told a vast congregation of young people in their late teens and early twenties - many of whom had bivouacked for 24 hours in the rain-drenched and mud-spattered mass venue (a former open cast coalmine) - not to practice "do-it-yourself" Catholicism. He told them they could not select which of the Church's teachings to obey and which to reject. A few hours later he told his Bishops that this contact in Cologne with young Catholics from many countries had stimulated and challenged him to think about the future of the Church and of society. The was a "dramatic" shortage of future priests in his homeland, he declared. Benedict's predecessor, John Paul II, invented World Youth Day two decades ago partly in order to stimulate the number of priestly vocations among young Catholics. Pope Benedict admitted that what called "wrinkles and shadows" had obscured the splendour of the Catholic Church in an age when Christian belief was weakening and Catholic ethics and morals were in constant decline. He lamented the state of religion in East Germany where he said the majority of the population are unbaptised and have no contact with the Church of Rome. This was one of the major policy speeches of his four month old pontificate. Pope Benedict has been in no rush so far to sketch out the personal imprint he wishes to make upon the institution which he now leads. But his 12 speeches in Germany have now given a clear lead as to where his priorities lie. The key passage in his address to the bishops was his affirmation that the church has to hold out promise for future generations of Catholics. He said the Church must not pander to youth, but must remain young in spirit. Catholic pastors must remember, however, that there must be no watering down of the Christian gospel and no false compromises. As one German newspaper succinctly put it "The Pope is offering no discounts". At the same time Pope Benedict reached out to Protestants, Jews and Muslims in separate meetings in Cologne. He called for greater dialogue with all three religious denominations. There must be no more wars of religion, he said. And he courageously told Muslim leaders that they must educate their young believers to discourage them from supporting fundamentalist violence. Pope Benedict is no populist. 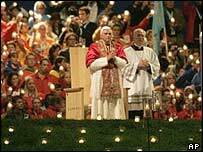 He was never tempted for a moment to sing along with the young people who had travelled from every continent to see him, as Pope John Paul II used to do on similar occasions. His approach to his new job, as befits his status as a distinguished theologian and former head of the Roman Catholic Church's highest disciplinary body, the Holy Office, is one of intellectual rigour and clarity of thought. But on the evidence of his first visit to Germany as Pope, he is learning to unbend in front of vast crowds. His kindly smile as he cruised along the Rhine on the prow deck of a chartered tourist boat was disarming. Crowds of people lined the river banks water to get a better view of him, some them wading into the water to get a better view. Some commentators likened the scene to seeing Saint Peter himself on the Lake of Galilee.